Although there are many upheavals to confront and many clients to deal with on daily basis but still designers never lose their heart at any cost, they face the trials, try to embark on every project differently, doing the best that they can and making an awesome end product which touches the hearts and minds. It is a lot of struggle if I may put it, nobody knows the sleepless nights behind the project, and the level of strain one has undertaken to make the project work. So we can never make assumptions and judgments how the person(s) has worked on it. Sometimes betrayal, carelessness and many other psychological factors make one restrain from doing one’s best but designers and artists never care about petty stuff and keep them all stressful things aside. A preoccupied mind can hardly produce anything good so it is very important to have a fresh mind open to ideas. Ever since the corporate world comes with many highs and lows, the circumstances are never the same. It takes courage and hard work to produce and invent something ‘flawless’. Therefore all the ingredients to this particular recipe are needed, without the spices the food does not taste good, right? Advertisements are as cardinal to a business’ expansion as a person’s name/designation in a firm. Therefore thousands and millions are spent on advertisements via electronic media or print media. However there are other mediums and sources as well to advertise, they too are helpful and they too drive a handsome amount of audiences. 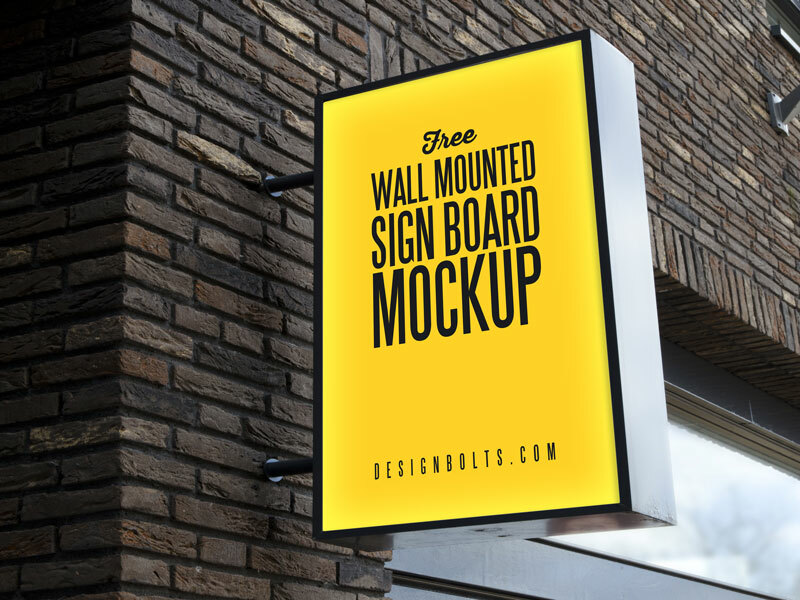 Down here you may look through this free outdoor advertising wall mounted sign board mockup PSD which can be used freely in personal/commercial projects. Insert the advertising elements into it and make a meaningful presentation out of it for your client. Use the bolder fonts and eye-popping colors in the advertisements so they may look clingy. This can motivate people towards the firm/shop and it may also serve as store locator (entirely depends on you, that how you want to use it). For more design and tech collection I am sure you will like to stay connected to us, this can be done when you subscribe to our blog. Here we go to come again tomorrow for sure with something interesting and useful.